need more ways to deal with stress? Check out this strategy..
It’s been a long time since my last newsletter and here is why. Last year was very stressful for me. I was worried and overworked. I did not sleep. I’ve got ulcers and other health issues. According to my doctor, all of them were stress-related. I was standing at the cliff, but I did not jump off. I fought and I won. I learned new ways to deal with stress in the process. Because at this very moment you may feel stressed too. You, too, may carry too much weight on your shoulders. Symptoms of stress differ from one person to another. You may get too much belly fat, too many aches and pains, relationship problems, or overall feeling of unhappiness, despair, and dissatisfaction with your life. It is not uncommon to get all of the above and more. For the sake of yourself and your family, you need to deal with stress before it is too late. By writing this, I want to pay forward and help. This year, I tried just about everything to restore the balance in my life. I started with food. I found that food can be both an ally and an enemy when dealing with stress. I tried many other things and ended with all-encompassing approach that you can call a lifestyle change. I am ready to share what worked and what did not if enough people are interested in this topic. To start, read this article on Dr. Mercola’s site. It contains a brief summary of causes and symptoms of stress, and 10 best ways to deal with stress. Check it out to find out whether you have any of these symptoms. And if you do, it may be a good time to stop in your tracks, find the sources of your stress and develop effective strategies of dealing with stress. Take time off to recharge and reevaluate your life. Here is how. Taking time off everything and going closer to nature helped to recharge my batteries. This year I rented a cottage called Healing Rock Retreat at the beautiful Bruce Peninsula in Ontario. I hiked and swam in the turquoise waters of Lake Huron. 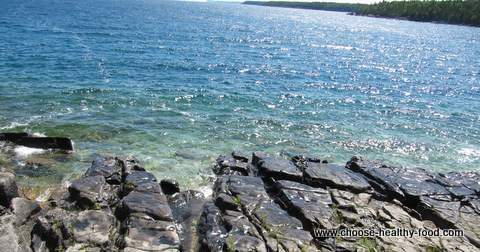 I enjoyed magnificent shorelines of Bruce Peninsula. I felt and looked very serene and fulfilled. And I’ve got more that I paid for. I met Daryl Wood, the owner of this place. She is a woman on the mission to help as many other women as she can to live meaningful and happy life. Daryl told me about a very special program that she runs for many years. Daryl is a life coach, and she runs Women's Wisdom Retreats devoted to women in mid-life. What is mid-life? Sounds scary? Says Daryl: “I believe mid-life starts when women have been through enough experiences to provoke personal reflection. For many it settles in when we are in our 40s, 50s and beyond while others get an earlier start. So there you go. Check out the website where other women share what they’ve got out of Daryl’s retreats and PLEASE pay it forward, share this message with other women who may be standing at the cliff. Don’t let them jump. Let Daryl help them out. She does coaching over the phone, too. I will continue writing about stress-related issues like compulsive eating, insomnia, weight gain, fatigue and others if there is any interest. So don’t be shy, drop me a line at olga@choose-healthy-food.com and tell me what topics are important for you. Even better, share your own story.